I have created the world's biggest writing by using a car and a GPS tracking device as a "pen." The writing -- "Read Ayn Rand" -- consists of 12,328 miles traveled and stretches from the Pacific to the Atlantic Ocean and covers 30 American states. The idea was conceived and "written" by me, Nick Newcomen, during the spring and summer of 2010. All expenses were paid entirely by me. 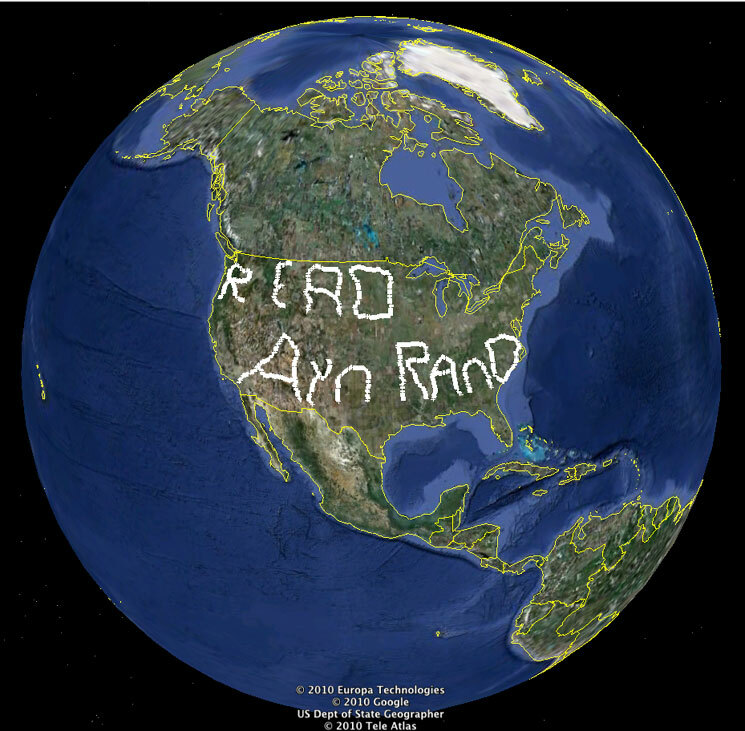 The first step involved identifying on a map the route I would need to drive in order to spell out "Read Ayn Rand." Then I drove the route. I used a GPS logger (Qstarz BT-Q1000X) to record my "writing." I turned on the device when I wanted to write and turned off the device between letters. I then input the recorded GPS data into Google Earth resulting in the image you see above. Ayn Rand was a Russian-American 20th century novelist and philosopher. She is best known for her novels Atlas Shrugged and The Fountainhead as well as for developing a philosophical system she called Objectivism. Relevance. The themes of her books, such as government control versus individual freedom, are highly relevant today. Specific events and characters in her novels are seemingly pulled from today's news even though the books were written over 50 years ago. Popularity. Her books are selling better than ever. Atlas Shrugged, for instance, sold a record half-million copies last year. Personal success. Her books are ultimately about the individual person living successfully and happily using his or her independent judgment and mind to the fullest. Reading pleasure. Her novels feature creative, page-turning stories with unforgettable characters. Solutions. She explains with refreshing honesty and clarity which basic ideas America must adopt and which it must reject if it is to remain a great nation. Controversial. Ayn Rand is passionately loved and passionately hated. Understanding. Her ideas have helped millions of people make sense of a seemingly incomprehensible world. Truth. Her ideas in essence are true. Vision. Ayn Rand provides a glimpse of a radiant future for all humanity. Influential. Atlas Shrugged is the "second most influential book for Americans today" after the Bible, according to a joint survey conducted by the Library of Congress and the Book of the Month Club.